Over the past few months I have been getting into a new segment of the RC model airplane hobby. In February I attended a discus launch glider competition. It was an exciting event! Discus launched gliding, DLG as it is often abbreviated, is a special type of glider which is hand launched by the pilot in the same way that a discus thrower launches a discus. These gliders have a peg attached to the wing where the pilot places two fingers. The pilot then typically does a spin and launches the glider from a side arm toss. Once the glider leaves the pilots hand there is no motor to keep it aloft. It is up to the pilot to find lift generated in the surrounding environment. Typically lift comes from thermal updrafts created by the heating of the ground. Good pilots can regularly find the smallest amount of lift and keep their planes airborne for many minutes to an hour! Starting with DLGs can be difficult. When searching for these planes you’ll instantly see that airframes can cost easily over $700. My best guess for a price for an average plane would be around $400-$500. Compare that to a foamie or an ARF nitro plane and you probably will wonder how anyone ever gets started with such a high initial cost. Luckily HobbyKing has come along and like most segments of the RC hobby they’ve released a good introductory product. Pictured above is the HobbyKing Mini Composite DLG. Being very cost conscious when entering into something that I may not want to continue to pursue, I decided that this DLG would probably be the best bet for the money. I was actually very surprised at the overall quality of the glider! I added in the OrangeRX RX3SM Micro Flight Stabilization DSM2 Receiver that I had sitting around. The receiver turned out to be just the right fit. Running the glider on a single Turnigy 300mah 1S lipo worked out when trying to get the CG correct. I was very impressed getting the glider out of the box. 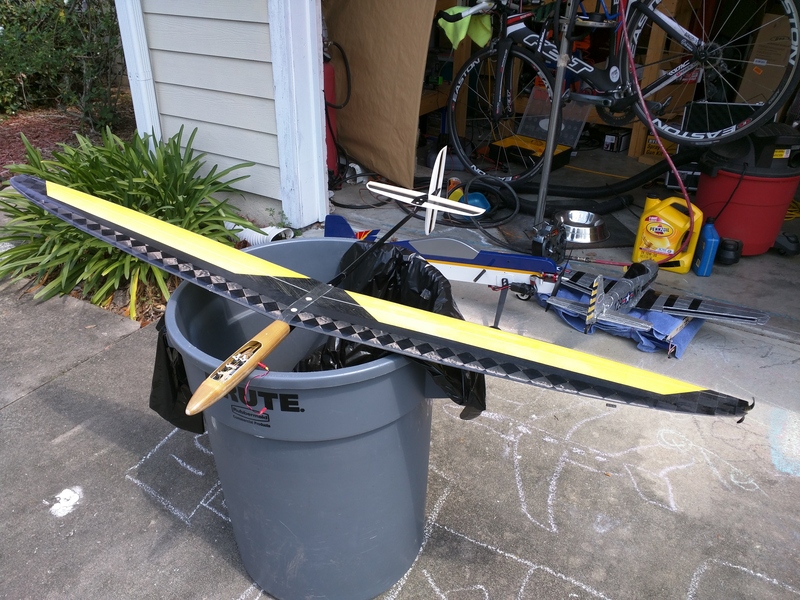 All I had to do was put the vertical stabilizer on with a screw, hook up the control rod to the elevator, and screw on the wing. Wow! My first impressions with the build quality was that it was worth the $100. My first flights showed that this glider was very nice right out of the box. The Mini DLG got me started learning how to launch and glide around. I received it a few weeks before the competition and practiced a few times before the event so that I could, perhaps, enter the competition. Well, after showing up on the Friday fun fly day I found that I was very much out of my leauge! The Mini DLG is under 1m wingspan. In F3K, the FAI designation for DLG competitions, you can have up to a 1.5m wingspan. The competitors had these 1.5m planes that were completely composite. They weighed under 280g (less than 11oz)! While I was welcomed by some very friendly members of the DLG/F3K community I just felt silly with my little HK glider. After the competition I still wanted to progress in the hobby so I kept throwing the glider. On one afternoon it some very windy conditions I made a not so great launch and cartwheeled the plane along. This broke the fuse. I have come to find out that weight is very important in DLGs. Even using the finest and lightest fiberglass cloth it made the plane much heavier. After some other embarrassing accidents I ended up having to fiberglass most of the plastic pod. The HK Mini DLG was now much, much heavier than when I originally received it. I also had to fix some of the balsa of the wings and tail feathers. I also found that packing tape can be a suitable covering material! For the long haul I find that the HobbyKing Mini Composite DLG makes it nice for someone wanting to get into the DLG aspect of the RC hobby without a lot of fuss. It is friendly on the wallet and also when you inevitably have to fix it. It ended up being that I really enjoyed DLG flying. It presents a unique perspective to gliding. Everything is done by you, the pilot. You must be able to launch your plane correctly to achieve a good altitude. It is also up to only you to find lift to maintain that altitude. If you cannot manage your aircraft you won’t be able to stay up for a good amount of time. It really makes you a better pilot. Not long after the competition I came into a little bonus money from work. As I mentioned earlier, it was my impression that most DLGs were going to be in the $400-$500 range. I decided that I would do my best to find an acceptable airframe in that price range. At the same time I decided that it would be a good idea to join the active DLG community on RCGroups.com. After reading a few threads in their forum I came to realize that I should probably start a search for a second hand DLG as if I could get a good deal I would save my time when it comes to assembling and setting it up. Most DLGs require some work getting the wings together and making sure the tail feathers are correctly aligned for the correct decalage and incidence. Building DLGs can be an art! I don’t think I looked but a couple times before I saw that someone in my area was selling a very, very nice DLG. It turned out to be one of the competitors that I had met. He was selling a very nice Storm DBox Prototype for $500. This plane would be like buying a new airframe for $700-$800 AND putting in electronics! I ended up buying the plane along with a FrSky Taranis TX since it was already set up for the plane. I’ll do a write up on this wonderful transmitter in the future. In short the TX is awesome and I wish I would’ve purchased one some time ago! The plane itself was more than I should’ve attempted flying. The Storm is a straight up competition flyer. It weighs next to nothing. Where the HK Mini would zoom around, the Storm just floats there. It reminds me of a very nicely folded paper airplane on a calm day. When I first got the plane, and even now, it was hard for me to launch it. In DLG it is not unheard of to have your plane destroyed when tossing it. It is called a wing (tip) strike. This happens when the plane is coming around under almost full momentum and the tip strikes the ground. In most cases it can destroy the entire plane and when you’re lucky it just demolishes the wing. The HK Mini is small enough that even with poor throwing form the risk of a wing strike is minimal at best. I wanted to be sure that I my first few throws wouldn’t be the end of such an immaculate plane that I filmed myself throwing the Mini. In the earlier YouTube clip you can see how I’m throwing more up than out. It took me a bit of time to gain the confidence to throw the Storm. Taking it slow has allowed me to keep the plane in one piece. I’ve yet to get out and start flying with the DLG regulars so I haven’t had any real time pointers. I’m told that this is the best way for improvement. Anyhow, I can say that I’m thoroughly hooked on DLG. Getting a nice DLG and showing it to those at your club will get all kinds of responses. Most are absolutely shocked over the weight of a 1.5m glider. Once you get good at catching a thermal they’ll be even more impressed with how long a simple hand toss will stay in the air! Tagged Discus Launch Glider, DLG, F3K, RC, RC Aircraft. Bookmark the permalink.